I guess I must have a thing for recreating dishes I eat in restaurants. Whether its the tomato & fennel risotto I used to eat at my favourite local vegan cafe (which has since shut down), or making a healthy, vegan version of the McChicken Sandwich burger at McDonalds, it’s evident that eating out is one of my biggest inspirations in the kitchen. This actually makes perfect sense to me. If you enjoy something incredible in a restaurant, why wouldn’t you want to be able to enjoy a close emulation at home? We all know that cooking and eating at home is one of the easiest, most effective ways to improve or maintain our health, reducing the amount of salt, sugar and oil in our diets. Now I’m not naive enough to think I can recreate every amazing restaurant dish I’ve eaten (Down The Hatch’s salt ‘n’ pepper tofu, for example, or Wagamama’s seitan katsu, will probably always be on too high a level). But there are indeed times when I think, hey, with a bit of experimentation, this is something I could probably knock up at home. Have you ever had a donburi bowl before? The Japanese word translates literally to ‘bowl’ and is a popular dish consisting of meat, fish, vegetables and other ingredients simmered together and served over rice. Donburi bowls are typically served in oversized rice bowls (also known as a donburi), which explains why a lot of the time they can be quite large servings. I’m perfectly fine with this, obviously. 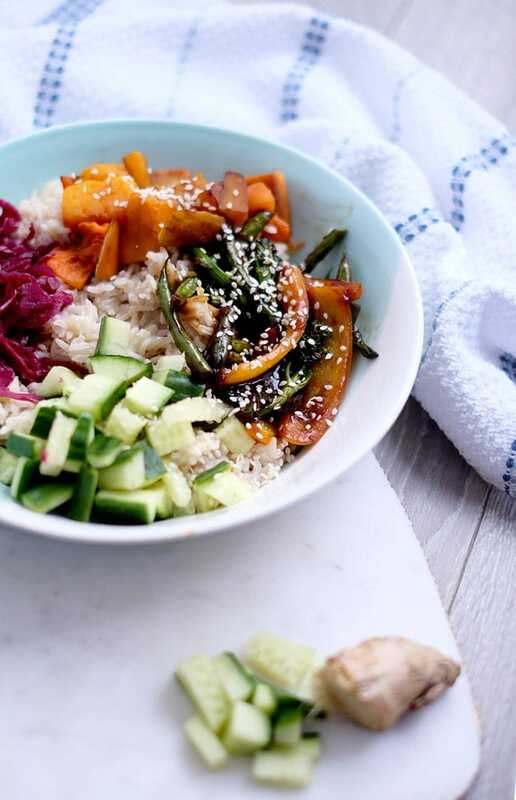 This particular donburi bowl recipe was inspired by the vegetarian donburi bowl at Izakaya, a sushi and Japanese food bar on Liverpool’s Castle Street. Now the restaurant barely lasted 18 months before falling prey to Liverpool’s competitive food scene and succumbing to the history books. And I kinda had mixed views about it when it was open (they changed the menu annoyingly often, it was sort of expensive and the portions were moderate at best). It’s for this reason I decided to whip up one of these bowls of my own, using similar ingredients and flavours as the Izakaya version. A delicious, tasty, filling meal you can enjoy any day of the week. Feel free to use either brown rice or sushi rice for this dish. 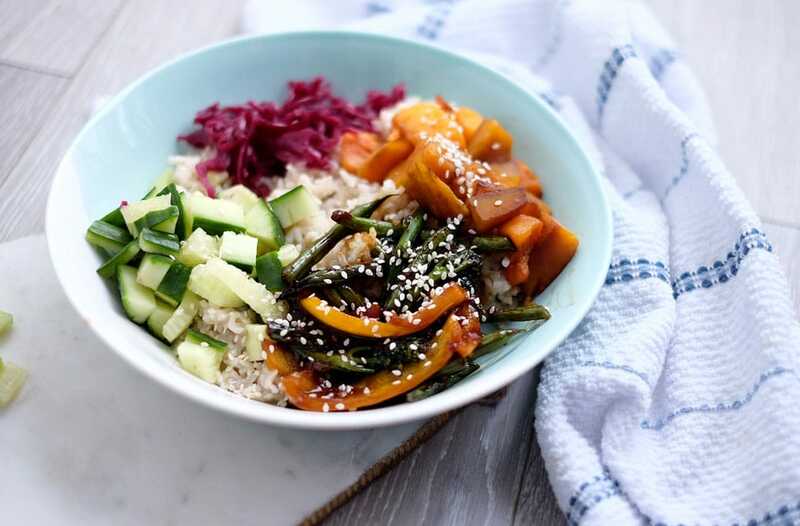 Brown rice will provide more fibre and protein, whilst sushi will offer a more authentic asian restaurant flavour. The teriyaki sauce is pretty moreish, I must warn you. It totally makes eating greens so much more appealing, and you might want to put it on everything. The balsamic-roasted butternut squash is a nice combo too I learned recently. You don’t have to add the balsamic vinegar to the squash (you can absolutely roast it plain). But trust me, it pairs perfectly with the squash’s sweetness. It’s now how I roast my squash all the time. 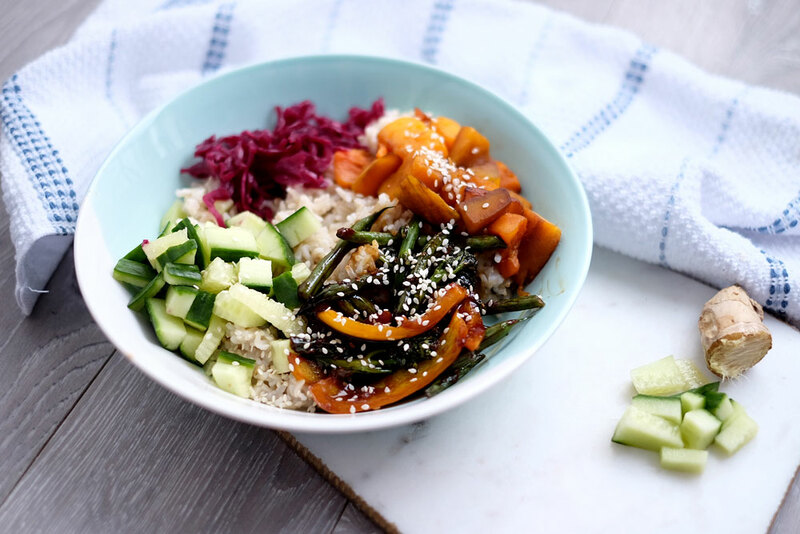 Feel free to include any other veggies you want in this bowl. 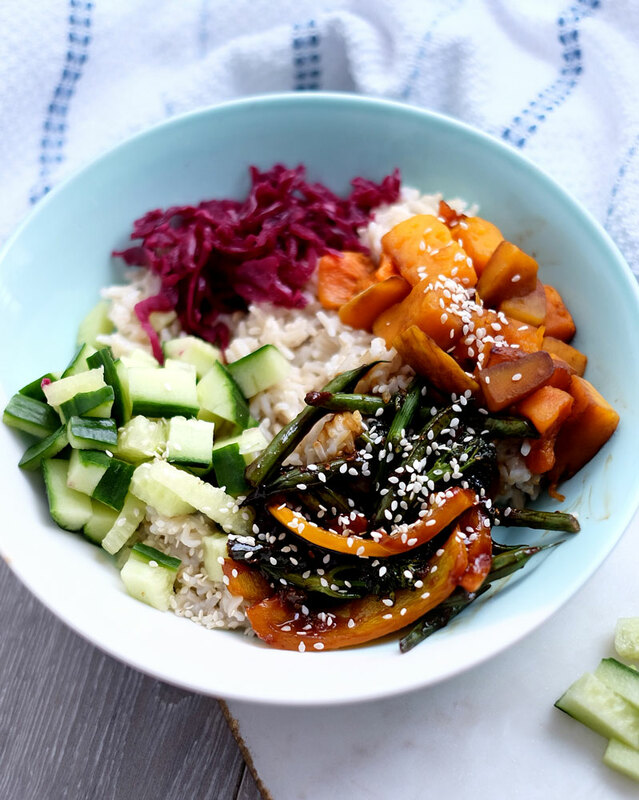 You could sub the squash for sweet potato, or use any vegetables you have to hand in the teriyaki stir-fry. The kimchi or sauerkraut is a nice touch at the end, and will add a dose of gut-boosting probiotics to this meal. Some red cabbage would work too. I’ve added some chopped cucumber to freshen the whole thing up, but you could totally add some other extras like avocado, shredded romaine or chopped spring onion. Lay the butternut squash chunks out on a tray lined with either tin foil or a silicone baking mat. Drizzle with some balsamic vinegar and a good grating of black pepper. Roast on 200°C for about 25-30 mins. About 15 minutes before the rice and butternut squash are done, cook the rest of the ingredients. Heat up a little water or veg stock in a wok or deep frying pan, and stir-fry the pepper and greens on a medium-high heat. When the veggies are turning soft (about 10 mins), blend up all of the teriyaki sauce ingredients in a high speed blender. Add to the vegetables in the pan and stir well. You’ll notice the sauce will thicken up almost instantly. When it does, reduce the heat to low-medium and keep stirring to allow the veggies to soak up the sauce. Add a little water if it goes too thick for your liking. 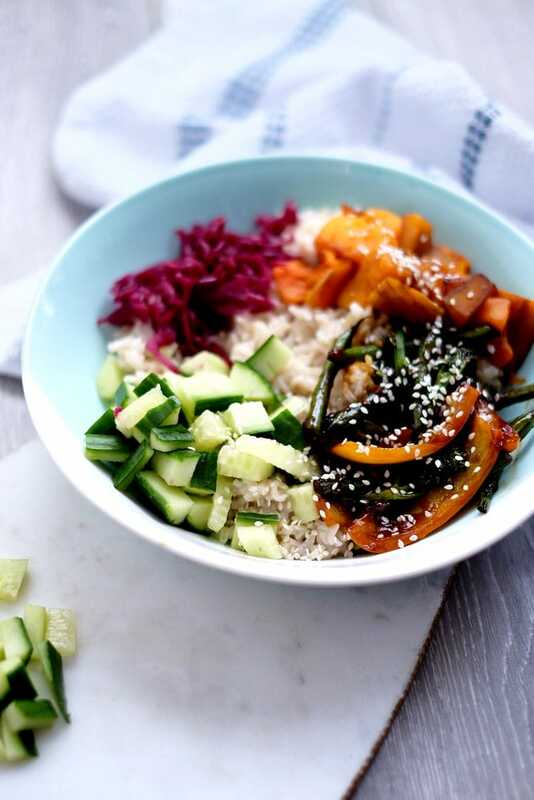 When the rice is ready, spoon it into bowls and top with the teriyaki veggies, the balsamic butternut squash, diced cucumber and a couple of spoonfuls of kimchi or sauerkraut.